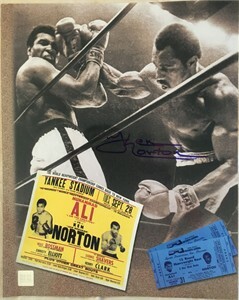 11x14 inch photo of heavyweight boxers Ken Norton and Muhammad Ali, autographed by the late Norton ONLY in blue marker. Authenticated by Real Deal Memorabilia, with their hologram on the photo and certificate of authenticity. ONLY ONE AVAILABLE FOR SALE.